We wish this attractive and capable range offered slightly more versatility. We’ve tested hundreds of ranges in our labs, and we have opinions about all of them. 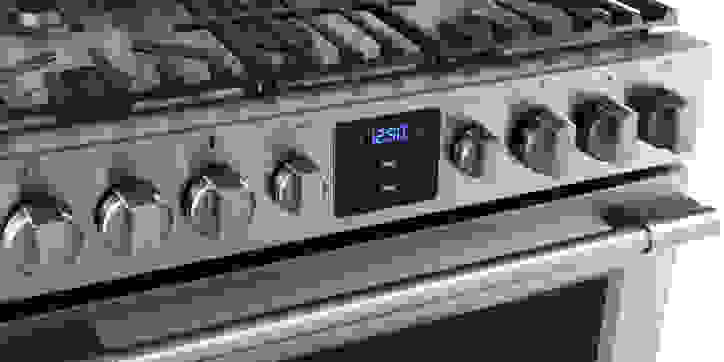 In the case of the Frigidaire FPGH3077RF gas range (MSRP $2,699), our opinions are a bit mixed. This 30-inch stainless steel range certainly looks worthy of consideration: It's part of the new Frigidaire Professional suite of appliances, which all combine an affordable price with high-end looks. It matches the Frigidaire Professional dishwasher, microwave, and refrigerator. The FPGH3077RF is an affordable, easy-to-install freestanding model, but has the appearance of a pricier slide-in. From the continuous cast iron grates to the 5.1 cubic-ft. oven cavity and slew of specialty oven functions, there’s an undeniable mix of utility and form. But when it comes to, you know, cooking, results were split. 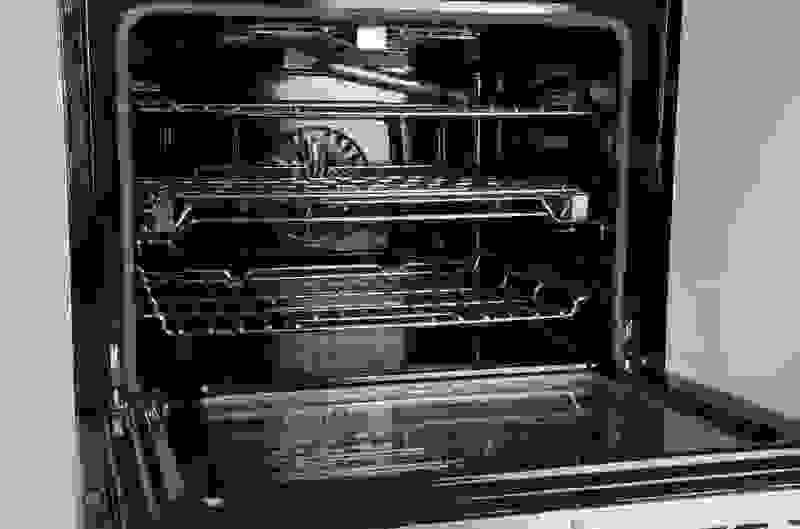 Yes, the oven bakes evenly, but we were puzzled by why Frigidaire chose such an odd mix of burners for the rangetop. Sure, temperatures can be relatively hot or mild, and it can boil water just fine, but there simply aren’t enough burners with acceptable temperature flexibility or speed. If you’re all about that oven and barely ever fiddle with the rangetop, then the FPGH3077RF is an undeniably wonderful option. But for a retail price nearing $2,000, a true professional would be able to prepare more than one dish at once. The FPGH3077RF might be a freestanding range, but it has that sleek, slide-in aesthetic. It's a definite step-up from the other Frigidaire Professional gas range—the FPGF3077QF—which looks a bit pedestrian by comparison. The 30-inch rangetop has five burners, including a dual-ring oval burner in the center. Continuous cast iron grates provide a convenient surface for moving your pots and pans. Inside the large, 5.1 cu. ft. oven cavity you’ll find three racks: gliding, standard, and an offset one for fitting a shallow item behind a tall one. Grip the pro-style stainless steel handle to open the cavity, but be careful when you let go. The oven door tends to slam shut unless you ease it carefully into what the oven industry calls the "broil stop"—where the door sits slightly ajar. You can tug a matching handle to access the storage drawer, set below the oven. Since there's no backsplash, all controls are mounted on the front of the range. The knobs are all metallic, but feel unpleasant to turn—stiff, scratchy, and wobbly all at once. When you turn the oven control, helpful stops allow you to select settings, which include PowerPlus Preheat, Bake, Convect Bake, Convect Roast, Keep Warm, Broil, and a pyrolytic self clean cycle. A Convection Convert option should come in handy if you’re not comfortable adapting recipes for convection, and a meat probe ensures you never undercook your poultry. Finally, dual timers mean you can keep track of two recipes at once. The 30-inch rangetop looks quite formidable with its heavy grates and 5-burner setup, but looks can be deceiving. As far as rangetops go, this one is usable. Both left burners get hot enough for most cooking tasks, reaching temps above 360°F. The right front burner gets even hotter, maxing out at 450°F—which is impressive for gas. None of the burners manage to reach especially low minimum temps, but the center oval burner can dip to 128°F if you use only the inner ring. However, speed is definitely somewhat of an issue here. The right front burner raced through our boiling tests, boiling 6 cups of water in just under 5 minutes. But the other burners will keep you waiting. The left front burner clocked in at nearly 14 minutes, but both rear burners took more than 20 minutes, and the center burner failed to boil at all. We don’t expect perfection from rangetops, but we do hope for enough versatility to perform multiple cooking tasks at once. In this sense, the FPGH3077RF drops the ball. You can cook over medium-high heat on multiple burners, but if you’re looking to simmer on more than one burner at once, you’re out of luck. And if you want to cook something quickly, there’s only one burner that’s up to the task. Where the rangetop fell short of our expectations, the FPGH3077RF’s 5.1 cu. ft. oven is one of the best gas models we’ve seen. The standard bake setting did a great job baking cakes and cookies evenly all across the board, and the convection mode was even better. If you’re looking for an oven with even heat distribution, this one has you covered. Preheat times were a little variable—fairly quick using standard bake, somewhat slower with convection. Still, you shouldn’t find yourself waiting more than 12 minutes to preheat the oven to 350°F. The broiler is also on the slower side, taking a little under 10 minutes to get scorching hot. The FPGH3077RF is covered by a standard limited warranty. For one year from the date of purchase, Electrolux will cover the cost of any repairs or replacements of parts that are defective in materials or workmanship. For more information, please consult the manual. Some ranges are all-around great or all-around bad. But what do you do when faced with a pricey range that's split between an incredible oven and a disappointing rangetop? With this range's affordably priced good looks, the question becomes that much harder. In the end, the choice is up to you. 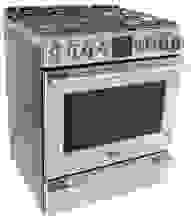 But you should know that this Frigidaire's style and features can't make up for a lack of overall versatility.